Yesterday I mentioned that the IceCube Neutrino observatory doesn’t detect neutrinos directly, but instead detects the flash of light that occurs after a neutrino collides with a water molecule. As you can imagine, the light emitted with a single neutrino collides with a single molecule is pretty faint. So how do we observe such faint light? 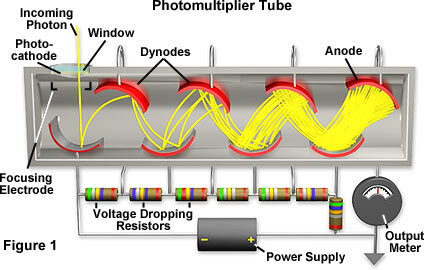 We use a photomultiplier tube (or PMT), some of which are so sensitive they can detect the light of a single photon. A PMT is based on something known as the photoelectric effect. Early observations of the photoelectric effect date back to the late 1800s, but it was made famous by Einstein’s 1905 paper, for which he won the Nobel prize. The basic idea of the photoelectric effect is that a negatively charged metallic plate can emit electrons when ultraviolet light is shined on it. Einstein demonstrated that this was due to photons striking the electrons and knocking them free of the metal. Of course a single photon can only knock out one electron, which would be very difficult to observe. So we need to use another effect known as secondary emission. In this case, fast moving electron striking a metal plate can knock free several slower moving electrons, kind of how a bowling ball can knock over several pins. In a PMT, a photon strikes a negatively charged metal plate called the photocathode, which releases the first electron. 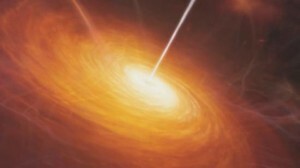 This is then accelerated toward another metal plate (known as a dynode) which it strikes, releasing a few electrons. 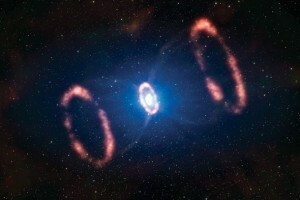 These are then accelerated to another dynode, releasing more electrons. The result is a kind of cascade effect (seen in the image above), where a single photon causes an avalanche of electrons to reach the final metal plate (the anode) where an electric current is created that we can measure easily. So a photomultiplier tube allows faint light to trigger an electric current strong enough for us to measure. Different types of PMTs have different light sensitivities, depending on the type of photocathode they use. Some are sensitive to visible wavelengths, while others are sensitive to infrared or ultraviolet. Under the right conditions, we really can detect the light of a single photon.